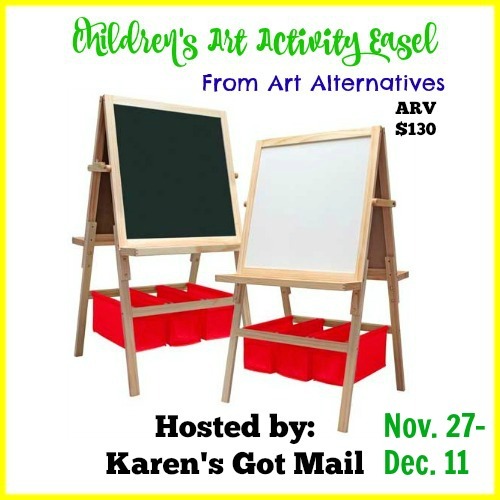 The Children’s Art Activity Easel From Art Alternatives is constructed of solid pine, features large trays on both sides and generously sized 23-1/4″ x 23-1/4″ white board and chalkboard. The large trays are the perfect size to hold all the supplies you may need at any given time using the easel. One lucky reader will win a Children’s Art Activity Easel From Art Alternatives, ARV $130! One of my favorite features of this item is that the adjustable legs accommodate users of different heights or can be adjusted as a young artist grows. One of my favorite features is the adjustable legs. One of my favorite features of this item is the sturdy, washable bright red baskets with ample built-in storage space. I like that the this easel can be converted to a table top easel. My favorite feature is that it has a white board or chalk board surfaces. I love that you can choose which one to use. I like that it can be adjusted for when your child grows. I like that the Children’s Easel Accessory Set comes with everything you need to start using the Children’s Art Activity Easel!